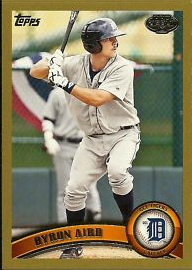 Just a quick reminder, 2011 Topps Pro Debut is live. In addition to the base there are three parallel color levels to collect. But, in the year of the Bryce, the biggest hit of the series is this 1/1 Cut auto from a signed ball. This set is a Hobby Exclusive so you will only be able to order a box. You can also visit your local card shop to see if they are selling packs. No retail on this one.